John Forman first thought up the Volleyball Coaching Wizards concept. 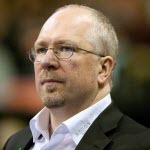 He authors the well-respected Coaching Volleyball blog. John most recently coached at Midwestern State University, an NCAA Division II program in Texas. This follows a stint as head coach of Svedala Volleybollklubb in Sweden’s top women’s league. Before going to Sweden, John coached university volleyball in the U.K. while earning a PhD at the University of Exeter. He’s now Dr. Forman. During that period, he spent time as a visiting coach with a pair of German Bundeliga teams. He also helped out a bit with the England youth national program. John previously coached at the NCAA Division I and Junior College levels. During that period, he was also a Juniors club director and coach. He is a member of the American Volleyball Coaches Association (AVCA). He holds a CAP II certification from USA Volleyball, and is a Volleyball England Level 3 coach.